Jacob Semik announced his commitment to Arizona State on Thursday afternoon, becoming the third Fighting Saint on the 2018-19 team to commit to the Sun Devils. Semik, who is in his third season with the Fighting Saints, has 19 points in 55 games this season and is a plus-five for the Saints. The blue liner has three points in Dubuque’s last five games. Semik decommitted from Michigan and will be committing to the Sun Devils for the 2019-2020 season. Arizona State is fresh of a landmark season which saw the team secure their first ever national ranking and also make their first ever NCAA tournament. Arizona State bowed out of the tournament in the first round to Quinnipiac. 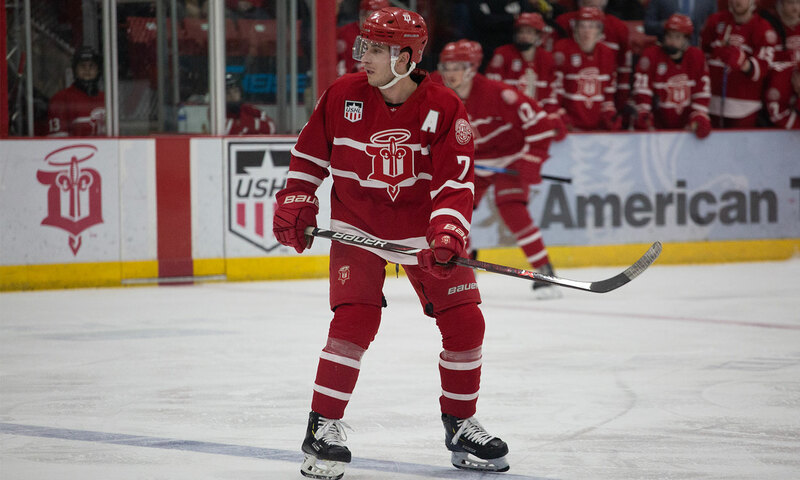 Semik is in his third season with the Fighting Saints and is top five on Dubuque’s Tier-1 list in terms of games played. Semik has hit the ice 146 times during his Saints career, not including playoffs. The Canton, Michigan native joins teammates Willie Knierim and James Sanchez, who both committed to Arizona State earlier this season.